Allianz Global Assistance, a leading provider of travel insurance and travel assistance, has launched the Android version of its innovative and enhanced smartphone app for travelers. The Apple version has been available since May. The TravelSmart™ mobile app now provides travelers with real time flight information, important medical resources, international emergency numbers, access to travel insurance information and one touch dialing to reach travel assistance and customer service. Access to Allianz Travel Insurance policies, including the ability to store policies and review coverage and benefits at the traveler’s convenience. Once a policy is stored, it can be reviewed without internet access. Travelers can also use the app to manage their policy including the ability to change the dates of their policy to correspond with a new itinerary. Real Time Flight Status Tracking allows app users to track their flight either by entering their flight number or by using the search function. The app provides on-time status and gate information. A database that allows travelers to find the closest Allianz-reviewed healthcare provider and view the phone number, address and website. The database includes 2,000 hospitals in 129 countries. The healthcare facilities in the database have been reviewed for travelers by Allianz Global Assistance. A country information database that includes three digit emergency phone numbers for 200 foreign destinations. The list includes countries from Afghanistan (119) to Zimbabwe (999). Each country listed also includes a link to the country’s Wikipedia entry. A Medication Dictionary allows users to store a photo of their prescription label and find international names for common drugs. These features make refilling prescriptions faster and easier while traveling. A First Aid Terms Translation feature provides translations for common illnesses, injuries and first aid needs. Describing an urgent situation accurately is an important factor in receiving an immediate and appropriate response. The TravelSmart Hotline button on the home screen allows travelers to reach Allianz Global Assistance medical assistance or customer service from anywhere in the world. 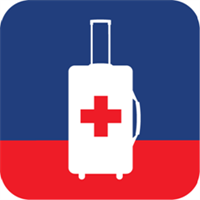 The TravelSmart app is free to download and use and can be accessed by visiting http://www.allianztravelinsurance.com/online/travelsmart. It can also be located in the Apple App Store™ at http://bit.ly/WTwFcc and is now available in the Google Play™ store at http://bit.ly/2cQH5WC. Allianz Global Assistance USA is a leading consumer specialty insurance and assistance company with operation centers in 34 countries. In the United States, Allianz Global Assistance USA (AGA Service Company) insures 21 million customers and is best known for its Allianz Travel Insurance plans. “Android” and “Google Play” are trademarks of Google Inc., which is a Non-Sponsor. “Apple” and “App Store” are trademarks of Apple Inc., which is a Non-Sponsor. “Allianz Travel Insurance” and “Allianz Global Assistance” are marks of AGA Service Company and/or Allianz Worldwide Partners. Marks not owned by AGA Service Company/Allianz Worldwide Partners are used without permission. Non-sponsors do not sponsor or endorse AGA Service Company/Allianz Worldwide Partners or this advertisement, and AGA Service Company/Allianz Worldwide Partners does not sponsor or endorse any of the Non-sponsors.